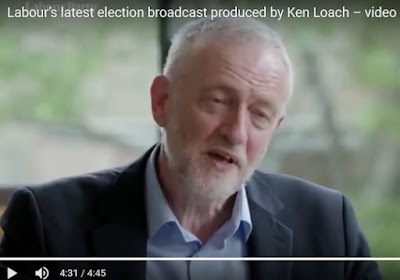 The 'genius of Ken Loach' must, I suppose, be such an unchallengeable fact for the Left that when he offers to do a Party Political Broadcast everyone swoons. But are leftie film critics necessarily a good guide to the thoughts of Joe and Jane Voting-Public? Anyhow, here it is. And Loach has completely done for Corbyn - cementing into the mind over four long, incoherent minutes that already-lethal image of the tired, toothy old man sitting on the floor of the train beside the toilet, muttering to himself and looking tetchy. And it's that, rather than his tatty old Marxism, that has finished him. Nobody votes to have Old Man Harold Albert Steptoe as PM. If Corbyn's people can't see it, they will be unable to make any good use of the 3 weeks they still have. Barring a truly lurid revelation about May, it's Game Over. Correction courtesy of Demetrius in the comments below - ta! "Nobody votes to have Old Man Harold Steptoe as PM. " Why prey, would anyone vote for the bag lady of Maidenhead [snigger]? Popular Culture is a funny thing. Mis-read it at your peril. Corbyn and his fellow travellers don't necessarily want to win the election. If they get the sort of votes the polls currently suggest then they will have succeeded in demonstrating that nearly a third of voters want to go back to 70s style socialism. Add in the cowardice of the PLP and the propensity of Theresa Heath to pick up left-wing policies and (sigh) the Overton window is suddenly heading in the wrong direction. We won't have EU rules to protect us, either (probably - state aid rules might end up in any agreement). The only consolation is that the cost of nationalisation is prohibitive - it was only accomplished post war because the value was so depressed. The father was actually Albert Edward Ladysmith Steptoe. If only he did lead a major party in the 1970's, the nation might well have voted him in. I can't bring myself to vote for anyone. Were Harold Wilsonin May's Cabinet, he'd be puffing his pipe contentedly. Corbyn and his cohorts are beyond pathetic. Tim Farron, the green thing and the tattered remnants of a party once known as UKIP are not worth firing off a synapse for. She is certainly trying to put some fight into Corbyn with that manifesto. When he sees the polls narrow to just 10% he will feel that just possibly the crown he doesn't want is almost within his spikes grasp. And clearly she wants to put backbone into the fleeing UKIP army. She's determined to furnish Nuttall with a rallying cry of don't let that woman take your house. Theresa knows we want the spectacle of a closely fought fight and not just a massacre of the idiots.
" Are you not entertained?! Are you not entertained!" He looks like Ho Chi Min to me. I'm a liberal (in the classic sense of the word) and it upsets me that I have absolutely nobody to vote for. I see May was directly channeling another British leader who led the nation against a Europe united under strong German leadership*, when she said today "let us go forward together". I assumed the headline was a joke but I have watched the video and can confirm that it must be a spoof. I particularly like the sudden-onset fake northern accent as he gets passionate. It could only have been better if he had been served a bacon sandwich while he was talking. As for the "classical liberals" who have "nobody to vote for", do they think that the system has a responsibility to provide a wide range of choices on the ballot? It is of course a perfectly valid choice not to vote, and leave the decision to the adults. And where have the "adults" got us BE? Does everyone love their MP and hold the HoC in the highest esteem? Or do most people loathe the political class? Charlie, the adults realise that everything is a compromise, is my point. Plenty of MPs are pretty well-liked, as you know perfectly well. If you want a Dutch-style system where you can express a preference as you buy cheese in the supermarket, or if you simply want to set up a Classical Liberal party, then why don't you get out of the shed? If you want the Tory party to offer a more libertarian prospectus, why don't you join it and go to meetings? Or maybe you think that if enough people are shrill on the internet then the waters will part? In which case may I recommend Corbynism? BE no real people are members of political parties anymore. They've left in droves. The only reward you get for speaking your mind was to have a central party apparatchik parachuted into your constituency who would obey the whip.